PONY baseball (and virtually all youth baseball organizations) will be adopting a new bat rule effective with the 2018 season. In conjunction with USA Baseball and its other participating national member organizations, PONY Baseball has adopted the new USA Baseball bat standard (USABat). Effective January 1, 2018, with the exception of -3 (BBCOR certified), all other 2 1/4" and 2 5/8" barrel bats with a minus factor of (-5, -7, -9, etc. ), must be USABat certified with the USABat licensing stamp on the bat in order to be used for league and tournament play. All 2 1/4" and 2 5/8" minus factor bats -5, -7, -9, etc. used in 2017 will be illegal to use in 2018. For LCBSA Shetland division play, bats labeled with “tee ball” may be used. Tee ball bats are not required to undergo lab testing to receive approval under the USABat program. However, to be approved for play, tee ball bats must carry the USA Baseball mark accompanied by the following text: "Only For Use With Approved Tee Ball Bats." If you already have a tee ball bat you would like to continue using, all you have to do is purchase a USA Bat sticker directly from USA Baseball and place it on your bat. You can purchase a USA Bat sticker, click here. Tee ball bats manufactured after the new rule was adopted will already include the USABat Baseball mark. * For Pinto 7 and all higher divisions, bats labeled with “tee ball” are prohibited. (a) If detected before the first pitch of an at-bat, the bat shall be removed from the game. The batter is not out and is required to use a bat that conforms to bat regulations. The manager and player of the team shall be removed from the game as well as the next scheduled game. (b) If detected after the first pitch (whether the pitch is swung at or not) the batter is declared out and base runners shall not advance. The manager and player of the team shall be removed from the game as well as the next scheduled game. (c) If detected after a ball is hit, the batter is out and base runners shall return to their original base prior to the hit. The manager and player of the team shall be removed from the game as well as the next scheduled game. Few decisions impact your game as much as choosing the perfect bat. You want a bat that’s the right size, right weight and right length for you–and within your budget. Improvements in technology have given today’s ball players more options than ever, so you’re sure to find a bat that feels like it was custom made for you. You just have to do your homework to find it. In most cases, bats are measured in inches and weighed in ounces. Length: Length and weight combine for peak performance. A longer bat gives you greater reach, allowing you to hit balls on the other side of the plate. But remember that a longer bat may be heavier, and the extra weight could slow you down. Like checking the weight, you need to swing bats of different lengths to decide what length best suits you. Weight: As a general rule, bigger, stronger players usually prefer a heavier bat for maximum power. Smaller players usually benefit from a lighter bat that allows greater bat speed. To determine the weight that’s right for you, swing a variety of bats and see how much weight you’re comfortable with. Since a player's power is generated through bat speed, it is important that you can swing your bat through the strike zone at maximum speed. Keep in mind that the right bat for you is based on personal preference. Make sure the bat you pick feels good when you swing it. The negative number found on all aluminum and composite bat represents the length to weight ratio of the bat or swing weight. An example would be on a 30" bat that has a "-9" would have a swing weight of 21 oz. 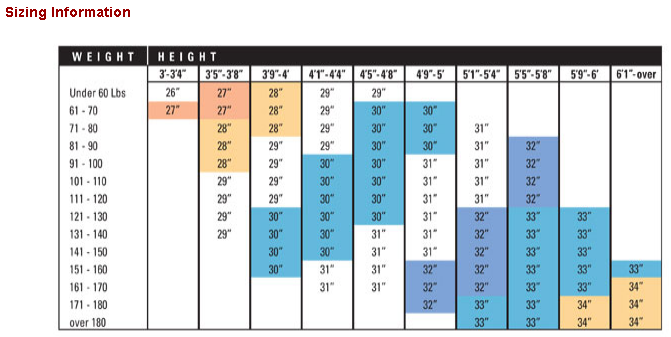 Your height and weight are good way to determine what bat length may work best for you. Use this guideline as a starting point. This chart is nothing more than an approximation of what size bat a player may need. When selecting a bat, you should take in to consideration your comfort level with the size you are currently swinging. As mentioned above, the process of picking the perfect bat is personal preference. If you have absolutely no idea what size to select, try some of your teammates' bats. Experimenting with swinging different sizes allows players to compare and contrast what they like and what sizes they can properly handle.